Property 11: Holidays in Lagrasse - Terrace Apartment with private terrace & garden views. Holidays In Lagrasse. Ground floor studio set in walled garden with pool. Property 15: Holidays In Lagrasse. Ground floor studio set in walled garden with pool. Property 16: Air-conditioned villa located in a land with trees and private pool. ADORABLE COTTAGE ZEN LAGRASSE near Carcassonne. Ideal for a relaxing stay. Property 18: ADORABLE COTTAGE ZEN LAGRASSE near Carcassonne. Ideal for a relaxing stay. Gite Le Vieux Pressoir, Montlaur. Near Carcassonne. In the heart of the Corbières. Property 30: Gite Le Vieux Pressoir, Montlaur. Near Carcassonne. In the heart of the Corbières. Property 35: Medieval village - house with all mod cons! Little house in the heart of "les corbières". Property 42: Little house in the heart of "les corbières". Converted Wine Cave With Small Court yard in the village of Labastide en Val. Property 45: Converted Wine Cave With Small Court yard in the village of Labastide en Val. Holidays in Lagrasse. Stunning Studio, private terrace near Carcassone. 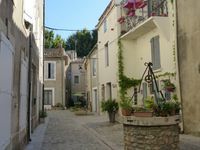 Property 47: Holidays in Lagrasse. Stunning Studio, private terrace near Carcassone. Guy and Claire are wonderful hosts and their spacious apartments, remodeled with their own hearts and hands, offer a gateway to this historic village and surrounds. One emerges and returns to this lovely home every day after trips through the small village that include small retail shops (and one wonderful patisserie). But Guy and Claire's assistance in helping give notable locations and places of interest was very helpful and providential. We are enthralled with the Corbieres countryside that is rich in history and beauty. The personal outreach by our hosts just added to the felt ambience and comfortability. I would go back in a minute...and stay longer!